A research breakthrough achieved by a team led by Associate Professor Ernest Chua from the Department of Mechanical Engineering at National University of Singapore (NUS) Faculty of Engineering could pave the way for a more environmentally friendly and cost-effective way of producing key essentials for daily living – electricity, water, air-conditioning and heat. This novel system is suitable for housing and building clusters, as well as underground cities, especially those in the tropics. The unique smart quad-generation plant produces all four key utilities simultaneously using a single, integrated system. Energy efficiency is optimised by maximising the recovery of waste energy that is generated. Specially designed for use in tropical countries, the plant offers greater energy and cost savings, and it is also more space efficient. In addition, this novel system can significantly reduce carbon dioxide emission by more than 30% while meeting the various needs of electricity, water, cooling and heating. The smart plant uses natural gas to power micro turbines to produce electricity. Waste heat generated from exhaust gas in the process is efficiently recovered and channelled back to power chillers to produce chilled water, which is required to cool and dry air for air-conditioning. The plant is also able to recycle non-potable water, such as rain water and water discharged from showers and wash basins, to produce drinking water. Waste heat generated from the plant could also be used to produce hot water or steam. The quad-generation plant also incorporates a dual-dehumidification system, which is designed by the NUS Engineering team after extensive research, to increase the efficiency of air-conditioning provision. Using novel super adsorbent materials and membranes, this system removes up to 50 to 60% of moisture from air – optimal for human comfort – to enable cooling to take place faster. In addition, this unique system can cool air with water that is chilled to just 13 to 18 degrees Celsius, instead of the usual lower temperature of 4 to 7 degrees Celsius. This contributes significantly to the plant’s overall efficiency as an increase in the temperature of chilled water by 1 degree Celsius translates into energy savings of about 3.5 to 4%. The NUS Engineering team also incorporated smart features into the plant, such as real-time tracking of power consumption, and controlling valves and pumps remotely. This will facilitate evaluation of energy efficiency and optimisation of the different processes based on the specific needs of each community of users. “The quad-generation plant is designed to be a distributed power entity. It is particularly suitable for serving clusters of buildings as well as underground cities, where key resources can be shared to reap economies of scale. 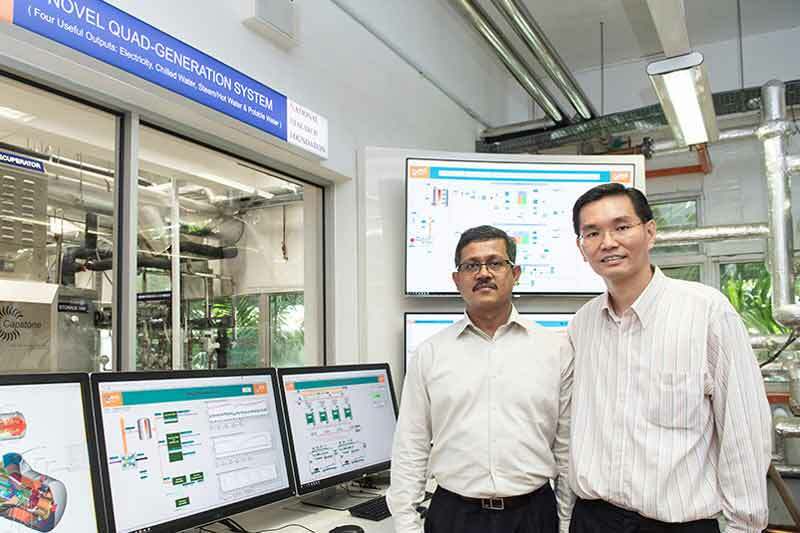 As power grids could be vulnerable to national security threats, our smart plant could also serve as a resilient distributed energy resource to continue to provide these essential utilities and minimise disruptions to daily lives,” added Assoc Prof Chua. The NUS Engineering team hopes to explore opportunities to commercialise and test-bed some of their patented technologies that have been developed from this project. This project is supported by the National Research Foundation (NRF) Singapore’s Competitive Research Programme.